Hey, hey, hey, are you excited Santa Fe Trail Days?! Hitch your wagon and head on over to Larned, Kansas on May 24th-26th, 2019 for a family-filled day of fun! This annual community event features: inflatables, live music, beer garden, hamburger/hot dog feed, concession and craft vendors, glow parade, car show, outside movie, ice cream social, community talent show, Frisbee Golf tournament and much more! 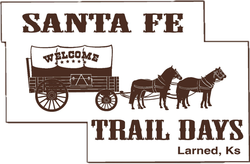 Santa Fe Trail Days is entering its 27th year and we couldn’t be more thrilled! This year, we're making the event more family -friendly and adding new and old favorite events into the 'Days. Hosted by the Larned Area Chamber of Commerce, the Chamber strives to improve the quality of life for the citizens of Pawnee County, making it a better place to live, work and play. Mark your calendars for May 24th-26th, 2019 and we will see you there!